"We are ready to obey all commands"
The Palmach (Hebrew: פלמ"ח, acronym for Plugot Maḥatz (Hebrew: פלוגות מחץ), lit. "strike forces") was the elite fighting force of the Haganah, the underground army of the Yishuv (Jewish community) during the period of the British Mandate for Palestine. The Palmach was established on 15 May 1941. By the outbreak of the 1948 Arab–Israeli War it consisted of over 2,000 men and women in three fighting brigades and auxiliary aerial, naval and intelligence units. With the creation of Israel's army, the three Palmach Brigades were disbanded. This and political reasons led to many of the senior Palmach officers resigning in 1950. The Palmach contributed significantly to Israeli culture and ethos, well beyond its military contribution. Its members formed the backbone of the Israel Defense Forces high command for many years, and were prominent in Israeli politics, literature and culture. The Palmach was established by the Haganah High Command on 14 May 1941. Its aim was to defend the Palestinian Jewish community against two potential threats. 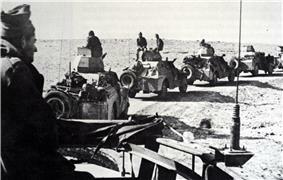 Firstly the occupation of Palestine by the Axis in the event of their victory over the British in North Africa. Secondly, if the British army were to retreat from Palestine, Jewish settlements might come under attack from the Arab population. Yitzhak Sadeh was named as Palmach commander. Initially the group consisted of around one hundred men. In the early summer of 1941 the British military authorities agreed to joint operations against Vichy French forces in Lebanon and Syria. The first action was a sabotage mission against oil installations at Tripoli, Lebanon. Twenty-three Palmach members and a British liaison officer set out by sea but were never heard of again. On 8 June mixed squads of Palmach and Australians began operating in Lebanon and Syria. The success of these operations led the British GHQ to fund a sabotage training camp for three hundred men at Mishmar HaEmek. Since the Palmach consisted of unpaid volunteers, the funding was used to cover the needs of twice that number of men. When the British ordered the dismantling of Palmach after the Allied victory at the Second Battle of El Alamein in 1942, the organization went underground. Since British funding had stopped, Yitzhak Tabenkin, head of the kibbutz union HaKibbutz HaMeuhad, suggested the Palmach could be self-funding by having its members work in the kibbutzim. Each kibbutz would host a Palmach platoon and supply them with food, homes and resources. In return the platoon would safeguard the kibbutz and carry out work such as agricultural work. The proposal was accepted in August 1942, when it was also decided that each month Palmach members would have eight training days, 14 work days and seven days off. The program of combined military training, agricultural work and Zionist education was called "Hach'shara Meguyeset" הכשרה מגויסת (meaning "Drafted/Recruited Training"). Later, Zionist youth movements offered members aged of 18–20 an opportunity to join core groups (gar'in) for agricultural settlement that became the basis for the Nahal. Basic training included physical fitness, small arms, mêlée and KAPAP, basic marine training, topography, first aid and squad operations. Most of the Palmach members received advance training in one or more of the following areas: sabotage and explosives, reconnaissance, sniping, communications and radio, light and medium machine guns, and operating 2-inch and 3-inch mortars. Platoon training included long marches, combined live-fire drills with artillery support and machine guns and mortars. 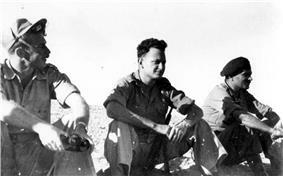 The Palmach put great emphasis on training independent and broadminded field commanders who would take the initiative and set an example for their troops. It trained squad commanders and company commanders. The major commanders training course was in the Palmach and many Haganah commanders were sent to be trained in the Palmach. The Palmach commanders' course was the source for many field commanders, who were the backbone of Haganah and, later, the Israel Defense Forces. For seven months after the assassination of Lord Moyne, members of the Palmach under the command of Shimon Avidan were involved in the Saison Operation, in which they cooperated with the British in an attempt to crush the Irgun and Stern Gang. 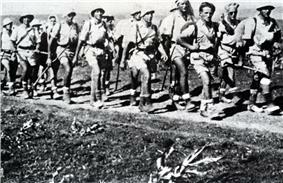 But with David Ben-Gurion's decision, 1 October 1945, to launch an armed struggle against the British, the Palmach entered an alliance with the dissident groups, called The Hebrew Resistance Movement. 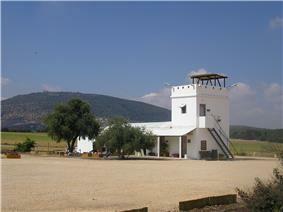 On 10 October 1945 a force led by Yitzhak Rabin raided the prison at Atlit freeing 208 Jewish prisoners. The first joint operation took place on 31 October 1945 when the Palmach sank three British patrol boats, 2 in Haifa and one in Jaffa, and were involved in 153 bomb attacks on bridges and culverts of the railway system. On the night of 22 February 1946 the Palmach attacked the Police Tegart fort at Shefa-'Amr with a 200-pound bomb; in the firefight that followed, the Palmach suffered casualties. In June 1946 the Palmach blew up ten of the eleven bridges connecting Palestine to its neighbouring countries. Fourteen Palmach members were killed during the attack on Achziv Bridge. The alliance was never completely under Haganah control and the Irgun launched a series of ever more ruthless attacks culminating in the King David Hotel bombing. This attack was the Irgun's response to a British crackdown, "Black Sabbath", launched on 29 June 1946. A combination of the crackdown and the Jewish civilian leadership's outrage at the King David attack led Ben-Gurion to call off further Palmach operations. After a gap of over ten months the Palmach resumed operations. The one weapon of which there was no shortage was locally produced explosives. On 20 May 1947 they blew up a coffee house in Fajja, specifically in retaliation for the murder of two Jews in nearby Petah Tikva. Following the escalation of violence after the UN Partition Resolution the scale of the retaliation operations increased. On 18 December 1947, in an operation approved by Palmach commander Yigal Allon, several houses were blown up in al-Khisas, near the Lebanese border; a dozen civilians were killed. On 31 December 1947 170 men from the Palmach launched an attack on Balad al-Sheikh, Haifa, in retaliation for the killing of 47 Jews at the Haifa oil refinery. Several dozen houses were destroyed and 60 villagers left for dead. Around Jaffa, Palmach units destroyed houses in Yazur and Salama. An order dated 3 January 1948 said "The aim is ... to attack northern part of the village of Salama ... to cause deaths, to blow up houses and to burn everything possible." In the Upper Galilee, the Palmach's third Battalion commanded by Moshe Kelman, attacked Sa'sa', 15 February, and blew up ten houses, killing 11 villagers. Further north, they raided al-Husayniyya, 16 March 1948, in retaliation for a land mine, they blew up five houses and killed "30 Arab adults". In the Northern Negev, 4 April 1948, a Palmach unit in two armoured cars destroyed "nine bedouin lay-bys and one mud hut" after a mine attack on a Jewish Patrol. During this period, in the event known as the Convoy of 35, the Palmach lost 18 men (along with 17 other Haganah fighters) on their way to reinforce the garrison at Kfar Etzion after they were attacked by hundreds of Arab locals and militias. The bodies of the Palmach and Haganah fighters were mutilated to the point that some of them could not be recognized. 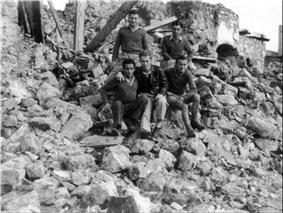 Palmach soldiers in the ruins of Al-Qastal, April 1948, after fierce fighting with the Husayni Army of the Jihad. On 20 February 1948 the Palmach launched an operation in Caesarea, North of Tel Aviv, in which they demolished 30 houses, six were left standing due to lack of explosives. The objective was to prevent them being occupied by British troops as a base against illegal immigrants. Yitzhak Rabin opposed the attack. Although occupied by Arabs the buildings were Jewish owned. With the activation of Plan D and its sub-operations Palmach units were used to demolish villages with the objective of preventing them being used by Palestinian irregulars or the ALA as bases. Following the attempt to clear the road to Jerusalem, Palmach units "more or less systematically leveled the villages of al-Qastal, Qalinya, Khuda and largely or partly destroyed Beit Surik, Biddu, Shu'fat, Beit Iksa, Beit Mahsir and Sheikh Jarrah (Jerusalem)". On 9 April a Palmach unit with mortars took part in the Irgun attack on Deir Yassin. Following the failed ALA attack on the Haganah base at Mishmar Ha'amek, and the Haganah's refusal of an offer of a truce, Haganah and Palmach troops counterattacked. Between 8 and 14 April ten villages came under Palmach control. Within two weeks they were leveled. According to Walid Khalidi, the objective of this operation, under the command of Yigal Allon, was to clear upper Galilee of its Arab population. The operation log book, 4 May 1948, states "blow up the houses and burn all the bedouin tents". Typical of the attacks was that on Mughr al-Khayt whose residents fled after a night of bombardment on 2 May 1948. 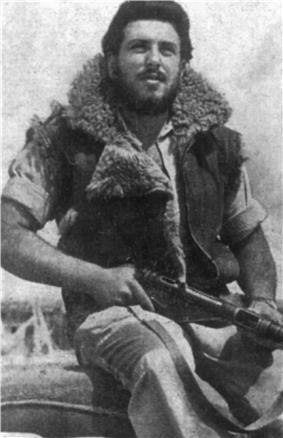 Also on 2 May, the Palmach 3rd Battalion, commanded by Moshe Kelman, attacked Ein al-Zeitun with a Davidka, two 3-inch mortars and eight 2-inch mortars. During the following two days Palmach sappers blew up and burned all the houses. In the aftermath of the capture of this village Battalion Commander Kelman ordered the execution of seventy prisoners. On 6 May the Palmach launched an attack on Safad. It failed to capture the citadel and the Palmach had to withdraw. The defenders offered a cease-fire, which Allon refused. A second attack was launched on 9 May. This was preceded by a "massive concentrated barrage" using mortars and Davidkas. The empty Arab quarter of Safad was occupied on 11 May. Between 12,000 and 15,000 refugees had been created. The Palmach suffered 69 killed during Operation Yiftah. In May 1948 the Palmach had 2,200 permanently mobilised members. A different source puts the size of the Palmach as 3,000 at the end of November 1947, and, following the mobilization of 3,000 reserves, five battalions were formed by May 1948, consisting of 5,000 fighters of whom 1,200 were women. Palmach units took a major part in the 1948 Arab–Israeli War. At the beginning of the war, Palmach units were responsible for holding Jewish settlements (such as Gush Etzion, Kfar Darom and Revivim) against Arab militias. Although inferior in numbers and arms, Palmach soldiers held out long enough to allow the Haganah to mobilise the Jewish population and prepare for war. The Palmach's last operation as an independent unit was against the Irgun, in the Altalena Affair. On 22 June 1948 the Irgun moored the Altalena, loaded with weapons, off Tel Aviv. Ben-Gurion ordered the Palmach to prevent the arms being landed. In an operation commanded by Yigal Allon, with Yitzhak Rabin as his deputy, a cannon was used to sink the ship. One member of the Palmach and fourteen members of the Irgun were killed. After the establishment of the Negev Brigade, the Yiftach Brigade, and the Harel Brigade. The Negev and Yiftah Brigades fought in the Negev against the Egyptian army and managed to stop and later repulse it into the Gaza Strip and Sinai. The Yiftah Brigade was later transferred to the north. The Harel Brigade was centered on Jerusalem. The merging of the Palmach into the Israeli army involved a series of power struggles with Ben-Gurion, known as The Generals' Revolt. In 1949 many senior members of the Palmach resigned from the army. In total, the Palmach lost 1,187 fighters during the war of independence and in the years prior to Israel's creation. The Palmach memorial site records 37 deaths of Palmach members between May 1941 and May 1945. Thirty-one are described as killed in action, six were killed while serving in the British Army and six were killed in the "Struggle against the British Government". A further 39 members of the Palmach died between the May 1945 and November 1947. Twenty-one are recorded as killed in action and one killed in battle, fourteen being killed during the attempt to blow up the Achziv Bridge during the Night of the Bridges. Twenty-eight died in the struggle against the British. Between the beginning of December 1947 and the end of May 1948, when the Israeli army was created, 574 deaths are listed. Five hundred and twenty-four were killed in action or in battle; seventy-seven while on convoy duty or securing roads; fifty-nine during Operation Yevusi, including thirty-four at Nabi Samuel; twenty during Operation Nachshon, all at al-Qastal; sixty-eight during Operation Yiftach; twelve at Mishmar HaEmek. By district one hundred and seventy-one members of the Palmach were killed in Jerusalem and the surrounding area, one hundred and four in and around Gush Etzion, one hundred and three in the Galilee and eighty-one in the Negev. From June 1948 to December 1949, during which time the Palmach was absorbed into the army, 527 members died, four hundred and fifty-two killed in action or in battle; one hundred and one were killed during Operation Danny, including forty-five at Khirbet Kurikur; fifty-three during Operation Yoav; forty-four in Operation Horev and twenty-two during Operation Death to the Invader. By district two hundred and thirty-four died in the Negev and Southern Plain; sixty-two in Jerusalem and surrounds; forty-four around Latrun; forty-two in the Gaza Strip and forty-one in the Central Plain and Coastal Strip. By Brigade, 313 members of the Harel Brigade were killed, 312 from the Negev and 274 from the Yiftach. One of the dead is listed as also being a member of the Lechi. The Palmach memorial site records the death of 34 female members, seventeen killed in action or in battle. Around 520 of the fatalities had been born in Palestine; of whom one hundred and seventeen where from Tel Aviv, ninety-seven from Jerusalem and fifty-six Haifa. Over 550 had been born in Europe and Russia; with one hundred and eighty-one from Poland, ninety-nine from Germany and ninety-five from Romania. 131 of the dead originated from Arab and Muslim countries; thirty-two from Turkey, twenty-three from Syria and twenty-one from the Yemen. Of the remainder thirteen had been born in the USA. Of the dead, 633 were aged between 18 and 22 years, 302 were between 22 and 25, 138 were 26 and over, and 91 were under 18 years of age. 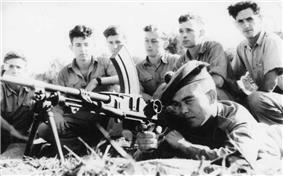 The Palmach was organised into regular companies (six in 1943), and five or six special units. Ha-Machlaka Ha-Germanit: the "German Platoon" (aka the Middle East Commando) performed covert operations and sabotage operations against Nazi infrastructure in the Middle East and the Balkans. Ha-Machlaka Ha-Aravit: the "Arab Platoon" performed covert operations and espionage missions against Arab militias, which frequently attacked Jewish settlements. It was the base for the Israeli Defense Forces's and the Israeli Border Police's Mista'arvim units. Palyam (Sea Companies): the naval force of the Palmach was formed in 1943, attached to the Palmach's Staff Battalion (the 4th Battalion). They were in charge of underwater demolition and maritime activity units. The majority of their activities were related to the escorting of ships of Aliyah Bet, immigration ships (66 of them in all) bringing Jewish refugees from Europe by boat, despite the British White Paper of 1939, which introduced restrictions on Jewish immigration to Palestine. Palavir (The Air Companies): made up of Jewish pilots, the Palmach air force was incorporated into the Sherut Avir (predecessor of the Israeli Air Force) upon the Sherut's foundation in late 1947. Eighteen Taylorcraft Auster Mk V aircraft and two Mk IIIs were purchased by Aviron from RAF scrapheap at Tel Nof 14 January 1947, with at least 13 aircraft restored to flying condition. First delivered late Feb 1948, these were used by the Palavir's, Tel Aviv, Galilee and Negev Squadrons for supply, reconnaissance and light attack roles. Sabotage Units: explosives experts who became the basis for the Israeli Engineering Corps in the IDF. 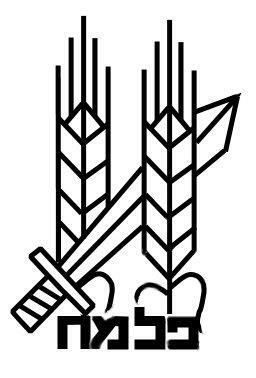 The Palmach put an emphasis on training field commanders (מפקדי שטח) and formed the basis for the Israeli army. 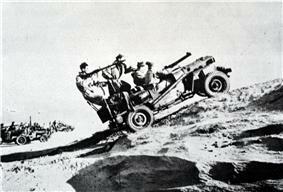 Negev, with four battalions (2nd, 7th, 8th and 9th), one of which was the jeep mounted "Negev Beasts"
The Command Battalion controlled naval, air and commando companies. The battle cry of the Palmach commander was "!אחרי" (Aharai), which literally means "after me!" or "follow me!". It refers to the commander leading his troops instead of sending them out and staying behind. The Palmach was a broad spectrum socialist parties. Its members trained and lived in kibbutzim. The political tendencies of its leaders such as Yigal Allon and Yitzhak Sadeh was towards Mapam, a left-wing party in opposition to David Ben-Gurion and the Mapai ruling party. In 1944 a major split had occurred in Palestine's Jewish community's dominant party, Mapai, led by David Ben-Gurion. The breakaway group, which evolved into Mapam, were inspired by Stalin's regime in the Soviet Union, and had a strong following in the kibbutz movement. Since most of the Palmach's members came from the kibbutzim, the Mapam dominated the Palmach, with a majority of its officers being members. After 1948 Ben-Gurion, Prime Minister and Minister of Defence of the new state, had a series of confrontations with leaders of the Haganah and the Palmach. In a process that Ben-Gurion described as de-politicizing the army, the three Palmach brigades were disbanded and in 1950 most of the Mapam officers resigned. Those Palmach members who had been in Mapam and remained in the army had to endure several years on the margins. The effect of the de-politicizing was that all senior army posts were held by Mapai members or Ben-Gurion loyalists. After demobilization many Palmach members founded new kibbutzim. In 1949 they set up Bar'am, Beit Guvrin, Nir Yitzhak (named in honour of Yitzhak Sadeh), Palmachim, Re'im, Rosh HaNikra, Re'im and Yir'on. Palmach members were not, however, a unified, homogeneous collective with a single ideology. In the early years of the state of Israel they could be found in all political parties. Yigal Allon, considered by many to be the representative of the Palmach generation, never reached a position of national leadership although he was Prime Minister for a few days between Eshkol's death and Meir's appointment in 1969. He died in 1980. Besides military contributions, the Palmach had great influence over the Israeli "Tzabar" culture. Palmach activities included "Kumzitz" (sitting around a fire at night, eating, talking and having fun), public singing and cross-country walking trips. These often took on mythical proportions and have become favorite activities for Israelis. The Palmach also contributed many anecdotes, jokes, "chizbat" (short funny tales, often based on exaggerations), songs and even books and stories. The Palmach will win - we've vowed. Till we bring it peace again. We are seeking out the foe. The Palmach will march in might. Shimon Avidan – commander of the "German Department"
Israel Ben-Yehuda – commander of the "Arab Department"
Yigal Allon – commander of the "Syrian Department"
The Palmach Museum, located on Chaim Levanon Street in Tel Aviv, near the Eretz Israel Museum, explores the Palmach legacy through the stories of individuals and groups. Visitors to the museum join the group of young Palmach recruits from its establishment, and advanced through the story of the Palmach until the end of the War of Independence. ^ Peri, Yoramn. Between battles and ballots—Israeli military in politics. CUP 1983. ISBN 0-521-24414-5. p. 61. ^ Allon, pp. 118, 119. ^ Allon, pp. 126, 127. ^ Eric Silver, Begin, A Biography. 1984, ISBN 0-297-78399-8. p. 51. ^ Edward Horne, A Job Well Done, A History of the Palestine police Force 1920–1948. 1982. p. 289. ^ Horne, pp 295,296. Also note the author's comment that the Palestine Police found the Palmach easier to penetrate than the Irgun. p. 298. ^ Night of the Bridges 17/6/1948.http://www.palmach.org.il/show_item.asp?itemId=8519≤velId=42855&itemType=0 Fallen soldiers - First Battalion. ^ Silver, p. 64: 27 December 1946—10 British servicemen killed; 25 February 1946—20 RAF planes destroyed; 26 April 1946—6 paratroopers killed in their beds at their Tel Aviv barracks. ^ Silver, p. 68: Weizmann threatened to resign "I demand you stop all operations by all three underground groups." 17 July 1946. (before the King David bomb). p. 73: Ben-Gurion acquiesced in a return to diplomacy. ^ Dov Joseph, The Faithful City—The Siege of Jerusalem 1948. Library of Congress number 60 10976. p. 8: "For example, all the land mines used against Rommel came from Jewish factories in Palestine." ^ Walid Khalidi, All That Remains. 1992. ISBN 0-88728-224-5. p. 240. ^ Benny Morris, The Birth of the Palestinian Refugee Problem. 1987. ISBN 0-521-33028-9. p. 156. ^ Khalidi, p. 465. Including 4 children. ^ Morris, pp. 33, 34. ^ Morris, pp. 43, 156. Puts the number killed at the refinery as 70. ^ Khalidi, pp. 195, 196. Quotes New York Times 16/2/1948 five small children. ^ Morris, p. 54. Describes it as "the first pre-planned expulsion of an Arab community by Haganah in 1948". ^ Khalidi, p. 309, quotes Harry Levin's eyewitness account; p. 278., 41 houses destroyed in Bayt Naqquba; p. 276, gives the size of Sixth Battalion as 400–500 men. ^ Morris, pp. 158, 159. "systematically destroyed". ^ Khalidi. For example: p. 142, Abu Shushe, 155 houses in 1945 survey; p. 143, Abu Zurayq, 30 houses blown up; p. 160, al Ghubbayya, 38 houses; p. 169, al Kafrayn "blown up completely", 95 houses; Al Mansi "all houses blown up", 98 houses. ^ Khalidi, p. 428: "cleanse the interior". ^ Morris, p. 103. Also Morris, p. 122: 5 May, Palmach sappers blew up 50 houses in al-Zanghariyya and other villages in the area. ^ Khalidi, p. 436. 1933 census counts 127 houses in 'Ayn al-Zaytun. ^ Eric Silver, Begin, A Biography. 1984, ISBN 0-297-78399-8. p. 87: "Mid 1947 ... full-time Palmach, with 3,100 men and women". ^ Dov Joseph, The Faithful City—The Siege of Jerusalem, 1948. 1960. Library of Congress number 60-10976. p. 29: 2,100 fighters, 1,000 reserves. ^ Kimche, Jon and David (1960) A Clash of Destinies. The Arab–Jewish War and the Founding of the State of Israel. Frederick A. Praeger. Library of Congress number 60-6996. p. 77. Authors use "girls" rather than "women". ^ . Fallen Soldiers-Place of Fall- Tel Aviv, Seashore. ^ Silver, pp. 107, 108. ^ Peri, p. 47. Five Brigade Commanders and its Commanding Officer Yigal Allon were members. ^ Peri, p. 62. Those who stayed: Yitzhak Rabin, Haim BarLev, David Elazar.